Summary: Satan will take advantage of Christians who let their guard down; sometimes prosperity is the worst thing that can happen to the church or even to an individual. Now there is a PROBLEM in the Jerusalem church. Previous to the incident recorded here the disciples had been of one accord; the church was fellowshipping and believers were experiencing the filling of the Spirit. In the prior lesson the apostles had been jailed and then beaten for preaching the gospel. However, believers were united and their lives were a testimony to their faith in Jesus Christ; the Church was off to a good start. It’s at times like this that you must be careful, because Satan will take advantage of Christians who let their guard down; sometimes prosperity is the worst thing that can happen to the church or even to an individual. Now there is a PROBLEM in the Jerusalem church. “In those days when the number of disciples was increasing” suggests that the church, at the outset, began to grow rapidly, and in verse 7 of this chapter we are told that a large number of priests became obedient to the faith: “So the word of God spread. The number of disciples in Jerusalem increased rapidly, and a large number of priests became obedient to the faith.” Even some of the Jewish religious leaders had been converted. “In those days” or rather about that time, points to when the Christian church was experiencing rapid numerical growth. The text doesn’t reveal when that occurred; it may have been several years after the planting of the church. The believers had become very numerous in Jerusalem. The word "disciples" was a common name applied to all Christians, to all that believed in Christ, and was the name they went by, before they were called Christians—“And when he had found him, he brought him unto Antioch. And it came to pass, that a whole year they assembled themselves with the church, and taught much people. 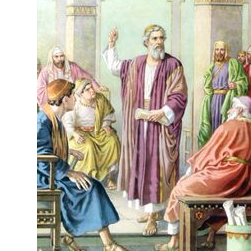 And the disciples were called Christians first in Antioch” (Acts 11:26). “There arose a murmuring of the Grecians against the Hebrews.” “A murmuring” refers here to a complaint by the Grecians against the Hebrews that there had been partiality in the distribution of alms or food made to the church’s widows who were of Greek descent. It appears from this and the instance of Ananias and Sapphira, that this first and pure Gospel church was not free from hypocrites; it also shows, that though they were united and harmonious at first in their affections and judgments, yet there were times when feuds, animosities, and contentions surfaced. Satan did his worst, and got a foothold among them, as he commonly does where the Gospel is preached, and he created all sorts of problems of which this is only one example. When Satan has assailed the Church on the outside, and with little result and in vain, he assails it on the inside, with civil dissension and strife among the brethren. “The Grecians” (Grecian Jews; Hellenists) were the Greek-speaking Jews who were mostly born in the provinces. They were those Jews relocated during the dispersion who lived in countries where Greek was spoken, and who themselves spoke Greek. It was for them that the Alexandrine Version of the Scriptures, commonly called the LXX was made. This class of Jews was found in almost every city where Paul preached (Acts 13:14-16). Admittedly, there has been much diversity of opinion in regard to these persons, whether they were "Jews" who had lived among the Gentiles, and who spoke the Greek language, or whether they were proselytes from the Gentiles. The former is probably the correct opinion. The word used here is not what is commonly employed to designate the inhabitants of Greece, but it properly denotes those who "imitate" the customs and habits of the Greeks, who use the Greek language, etc. In the time when the gospel was first preached, there were two classes of Jews - those who remained in Palestine, who used the Hebrew language, and who were appropriately called "Hebrews"; and those who were scattered among the Gentiles, who spoke the Greek language, and who used in their synagogues the Greek translation of the Old Testament, called the Septuagint. These were called "Hellenists," or, as it is in our translation, "Grecians." These were doubtless the persons mentioned here—not those who were proselyted from Gentiles, but those of Jewish origin who were not natives of Judea, who had come up to Jerusalem to attend the great festivals (See Acts 2:5, Acts 2:9-11). Dissensions would be very likely to arise between these two classes of persons. The Jews of Palestine would pride themselves on the fact that they dwelt in the land of the patriarchs and the land of promise; that they used the language which their fathers spoke, and in which the prophecies of God were given; and that they were constantly near the temple, and regularly engaged in its ceremonies and rituals. On the other hand, the Jews from other parts of the world would be suspicious, jealous, and envious of their brethren, and would be likely to charge them with partiality, or of taking advantage in their contact with them. These occasions of strife would not be destroyed by their conversion to Christianity. Satan will take advantage of Christians who let their guard down; sometimes prosperity is the worst thing that can happen to the church or even to an individual. Now there is a PROBLEM in the Jerusalem church.